Hibernation in computer means similar to doing shutdown mode in computer, but it saves the contents of its RAM (Random Access Memory) to the hard disk even if the powered off. It is more similar to sleep mode in computer but saves more power at the cost of slower resumption. After buying or installing new windows 8 operating system to the computer there will be shutdown, restart and sleep mode in power option but not Hibernate. 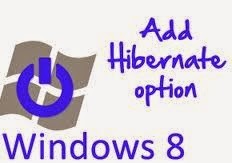 So, today we are going to enable hibernate mode in windows 8 step by step. First go to control panel and click on power options. Now click on 'what the power buttons does' at the left side of the window. Click 'Change settings that are currently unavailable'. Now Scroll down to the bottom of that window to find the 'Shutdown settings' section. Check the box next to the hibernate enable option and click on 'save changes'. 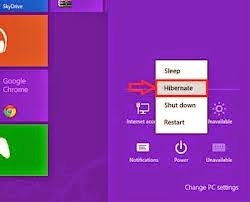 Now you are done Now you will see Hibernate mode in power option as shown in the picture below.